perfect for customer development, personnel rewards, and team building. Create your own experience based on the makeup of your group and your budget. Successful PGA Tour Coach and voted among the Top 100 Teachers in America. Clients include Kevin Chappell, winner of 2017 Valero Open. Featured instructor in Golf Magazine and Golf Digest. Noted Titleist Performance Institute and PGA event speaker. This is the clinic that really puts on a clinic. Choose Greystone CC or we can come to you. Golf specific performance based warm-up with Blackburn Golf Fitness Team. 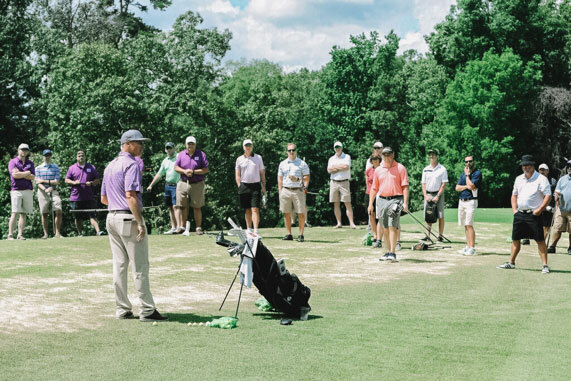 30-Minute “Load & Explode” Clinic with Top 100 Teacher Mark Blackburn. On range “Walk the Line Coaching” with Blackburn Golf Academy Staff 90 mins prior to shotgun start. Instructors will be equipped with video technology and coaching software. Live TrackMan on course analysis, leaderboard, and long drive hold. On Course Instruction from Blackburn Golf Team, 1 instructor per 9 holes. Follow up email from Blackburn Golf Team including video lesson and Trackman data. 20% Discount Code good toward future Blackburn Golf Instruction.